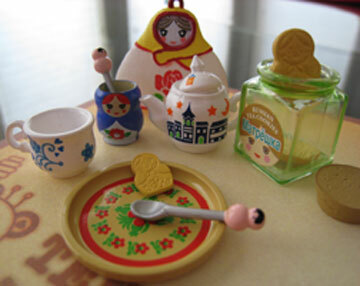 I have always admired Matryoshka dolls-- though I don't own one (yet) I have fallen in love with this little Russian Tea set from the Kawaii Kitchen line of re-ment...oh re-ment. 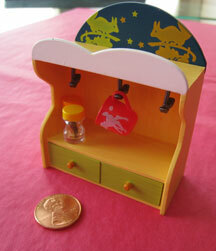 I am scheming ways to display my growing collection. Picture on the right is for scale. And Stephanie (thanks Steph and congrats on the Spin Off feature!) share this post with me today! how cool is that! Foodies Unite! Hello, my name is Amy... and I am addicted to Re-ment. I have had this addiction for over 3 years. Some know of it, others don't. I have a found a new store to feed the fever here in Phoenix, and its pure genius. This store gingerly opens the boxes, examines the goods, labels the design 1-10, and tapes it back up like new. So now I have a resource to find exactly what I want, with out the hastle of doubles/disappointment, high e-bay shipping fees, and the wait for US and international SNAIL mail. At this store I encountered an new friend, Jessica (visiting all the way from Minnesota), on the same mission as me-- finding Re-ment! After talking with her and oohing over the selections, she realized she knows me from BLOG land and reads my little blog...what are the odds? Thank you once again Al Gore for connecting all of us in the cyber-space world. 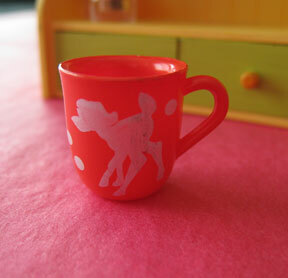 Here is a close up of the mug...yes that's a BAMBI shadow.